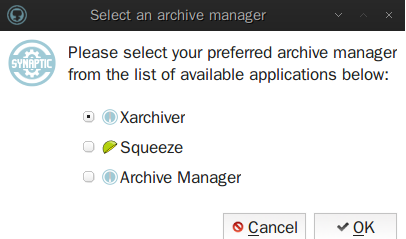 Selecting one in the list makes it the default archive manager, overwriting my previous setting. This happens in PCManFM and Thunar, but not in Nautilus. PCManFM is my default file manager as I am in Lubuntu 12.10 and have to keep using that. I had similar problems with the default file type program associations in ubuntu. You probably need to choose on of those in the list for the auto extract here options to work nicely. That does not mean that you cant change the default archive managing application. These posts go into some detail about how to change the association manually by editing the files used to map file types with programs. Where are file associations stored? How can I change the default text editor from gedit to vim? To change the stored associations, and priorities. ie which app show up first in a list have a look here. Try creating a new entry in the open with menu. I am not sure this will work as different command line programs use different options. A little experimentation my be need to get this working correctly. The problem is most probably linked to the parameters that pacman passes to application. How to see the full file name on the Lubuntu Desktop? How to enable check box in file managers?